What a night! It's as you were in the Spanish top-flight after wins for Barcelona, Atletico Madrid and Real Madrid, while Marseille and Borussia Dortmund reached the French and German cup finals. Missed any of it? Head over to our European index to catch up. Join us at the weekend to see if any of the Spanish trio will slip up. Job done. Real Madrid, after seeing Barca romp past Deportivo and Atleti sneak past Athletic Bilbao, keep pace with the leaders. Time for one last Villarreal attack, they have a free-kick about 25 yards out. Léo Baptistão is clumsily hacked down by Marcelo, but the set piece is worked out wide right and the cross is plucked out of the gloomy Madrid sky by Keylor Navas. And that should be that. Three minutes of stoppage time. Cristiano Ronaldo has already had enough...he's strolled off the pitch and down the tunnel. Probably wants first dibs on the bath. With the game won and the weather wet, many Madridistas are scarpering from the Bernabeu. Madrid knocking the ball around with ease, not much urgency to bag a third. Villarreal have a shot on target! Keylor Navas has hardly got his gloves dirty tonight, but is called into action as the game ticks into the final five. Denis Suarez's 25-yard free-kick has the direction, not the power. Easy save. 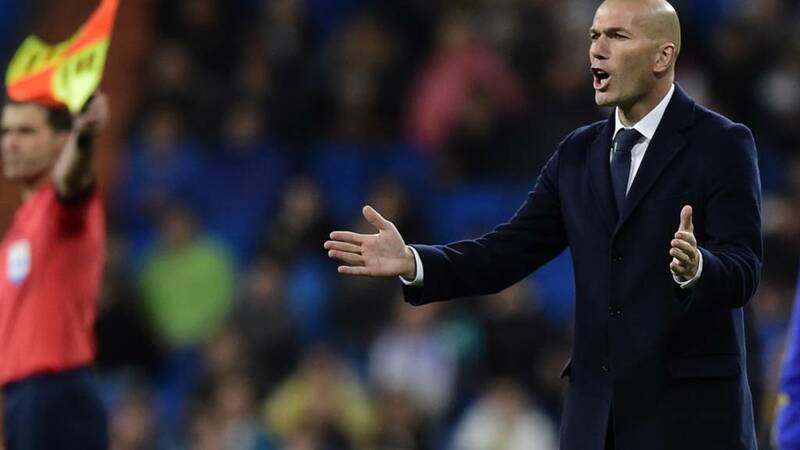 Zidane makes his final substitution of the evening, goalscorer Lucas Vazquez the man trudging off. He can be pretty smug about his night's work. Jese is his replacement. Huge standing ovation for Luka Modric when he is withdrawn for the final 10 minutes or so. On trots James Rodriguez. Pumped-up Cristiano Ronaldo is that vain he probably has a photo of himself in his wallet. He treats the Bernabeu to a glimpse of his ripped torso as he changes shirt on the touchline. No clear reason why he's swapping shirts, other than to get his bod out. Isco almost makes an instant impact. The Spain attacking midfielder has loads of time to curl into the bottom corner when the ball pings about the Villarreal box, but shanks his effort straight at Sergio Ramos. He's offside. Villarreal survive. Time for a tactical tweak from Zizou. Zidane lets Toni Kroos have a breather, Isco coming on in his place. So where are we in the Spanish title race? Real Madrid are coasting towards moving back within a point of Barca and Atletico. Four games left after tonight's action. Tight. Madrid's patience pays off! Young forward Lucas Vazquez is rewarded for a bright display with a goal. The Spaniard collects a neat return pass from Karim Benzema, before burying a low shot into the bottom corner. That's Madrid's 100th goal in La Liga this season. Madrid totally in control here, just need a second to extinguish any Villarreal hopes of a shock. Marcel probes down the left, then goes back inside as Luka Modric sends the ball out to the other flank. But Danilo shanks his cross out for a goal-kick, Cristiano Ronaldo boots the base of the post in disgust.